The IRS wants to remind all taxpayers that they should use only preparers who sign the returns they prepare and enter their Preparer Tax Identification Numbers. Check the person’s qualifications. 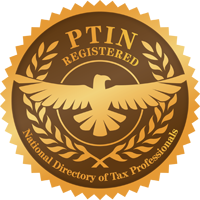 New regulations require all paid tax return preparers to have a Preparer Tax Identification Number (PTIN). In addition to making sure they have a PTIN, ask if the preparer is affiliated with a professional organization and attends continuing education classes. The IRS is also phasing in a new test requirement to make sure those who are not an enrolled agent, CPA, or attorney have met minimal competency requirements. Those subject to the test will become a Registered Tax Return Preparer once they pass it. Check the preparer’s history. Check to see if the preparer has a questionable history with the Better Business Bureau and check for any disciplinary actions and licensure status through the state boards of accountancy for certified public accountants, the state bar associations for attorneys, and the IRS Office of Enrollment for enrolled agents. The IRS can help many taxpayers prepare their own returns without the assistance of a paid preparer. Before seeking a paid preparer, taxpayers might consider how much information is available directly from the IRS through the IRS website.